But, in my class we don't just write a biography. What fun would that be? 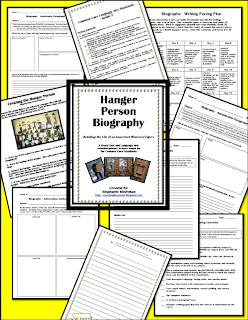 In addition to the actual biography, I have the students create a "Hanger Person" to go along with it. These are SO much fun! The kids really get into them and, consequently, have great writing as well. Most of this project is centered around the actual writing (as it should be). Because I have the ELL class, I heavily scaffold the writing process. 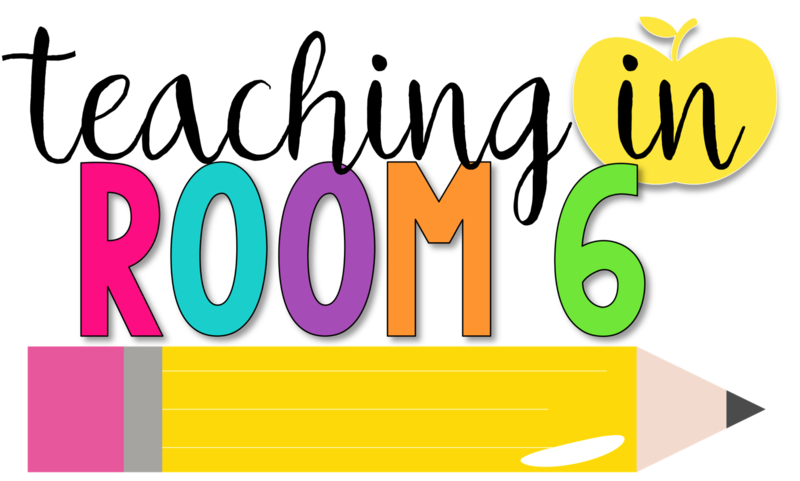 To tell you the truth, in 5th grade the students are still developing writers as it is, so I would scaffold no matter what. 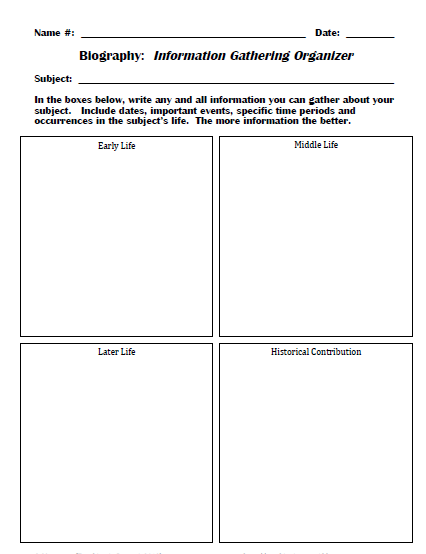 Each of my students choose a biographical subject (in this case, a Revolutionary War figure, as that is our major thematic unit of study) I then help them to organize their thoughts using a few graphic organizers. This is the organizer the students begin their research with. All info they find in each of the categories is just placed inside of the box. The students make the decision later on whether or not they will actually use the info in their writing. The initial information gather is just a mish mash of everything they find initially important. When doing this, I use the "I do, You do" model. 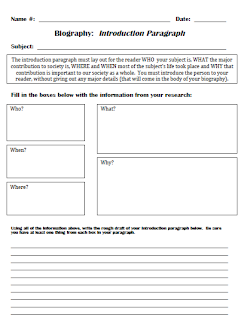 Basically, I model how to do a specific part (ie: finding information on the person's early life, or writing an introduction paragraph getting in all important information without giving away the body of the essay) Then, once the students have seen me do that specific part, they do the part on their own. Doing this has helped my class to not only become more proficient writers, but more confident in their writing as well. They see what I do, and use that as a model for their own. And, now, at this point in the year, they honestly don't need me to do as much scaffolding. They are striking out on their own and doing a great job! This is the Introduction Organizer. 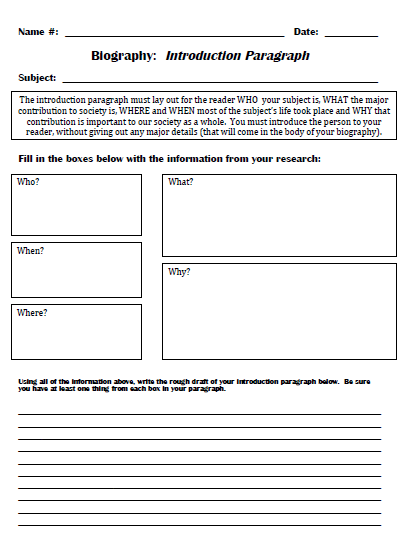 They do all work right on it to make it easier for the students to access the information and craft logical, interesting paragraphs. I help them to use this with the "I do, You do" modeling technique. Once the writing is done, the fun begins. I ask the students to create a "Hanger Person" in the likeness of their research subject. 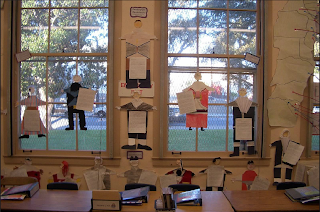 Using a hanger, tagboard, and some art supplies, the kids make the historical figure come to life. They LOVE this. They get SO into it too. George Washington actually wears a yarn wig. Benjamin Franklin has bifocals. Deborah Sampson is dressed like a man. The kids take their research and go all out in their creation! You can get the full project, complete with ALL of the scaffolding graphic organizers, rubrics, checklists, and standards at my TpT store. It is a project I promise your students, if they are anything like mine, will get a lot out of. Nice visual incorporation with the paper characters! 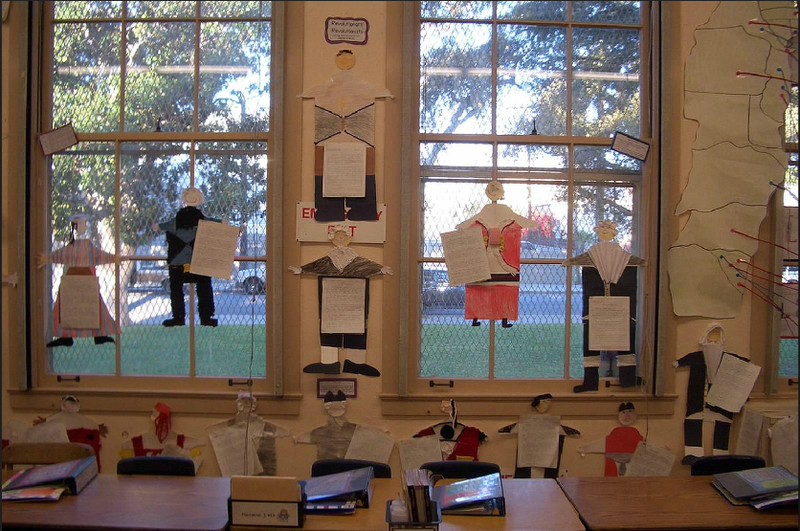 But, I gotta say, the windows in your classroom are what totally caught my eye. I sooo very much wish the building in which I teach had windows. There is only one in the building, and it happens to look into the parking lot. I have the students trace around their own bodies and then draw and color in details. They then add the quote that each person is best known for. Example: Paul Revere "The British are coming!" This is actually on my lesson plans for the final weeks of school this year. I love these. I am thinking about adapting it for book characters. Cute idea. I like the idea of using it for book characters. Steph, I bought this near the end of the year, and I CAN'T WAIT to try this with my students next year ... haven't decided if I'm going to do it with book characters, prime ministers, or Greek gods ... eclectic list ... I know! Awesome Idea! I was wondering if you knew what Common Core Standard this would align too? 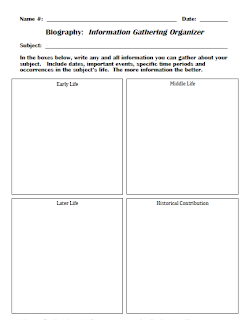 I am currently writing a unit and I want to have my students write a biography about a person in their lives, but I can't seem to decide on the appropriate standard? 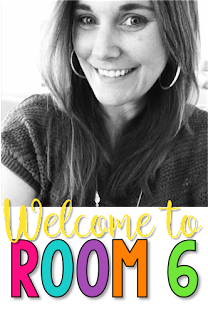 Love your site, Will check back for more great ideas! This was one of the first things I purchased on TpT, a couple of years ago because I saw the picture on Pinterest, and then came to this site. I just ran across it again and have very fond memories of doing this. I hope we get to it this year.